Allison: "Once our house was completed, I had hoped that life would 'settle into normal' and that I would be able to quietly begin to observe and record 'Maring everyday life' without interruptions. Looking back, I now realize that my idea of 'everyday life' was based upon growing up in a society where activities were carefully planned in advance and everybody's activities were coordinated by neat schedules." 012-05: Marek greets a visiting dignitary. Not only did the local people come by to see how we were getting along, there were also visits of people from other clans. 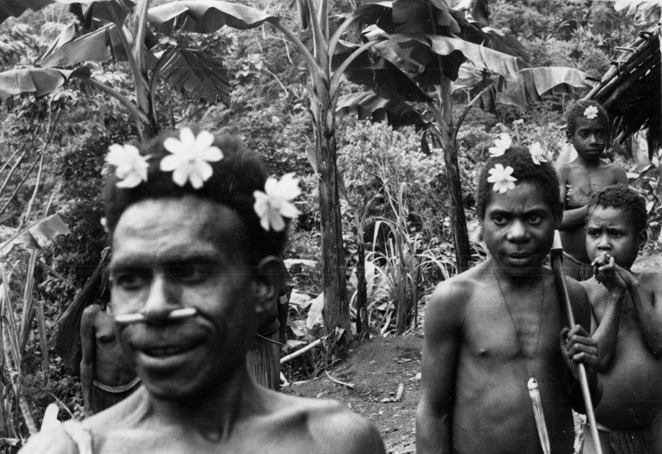 I was only slowly getting to know all of the 80 residents in the Fungai clan territory. The last thing I wanted to be confronted with was having to get to know an apparently never-ending number of other people. 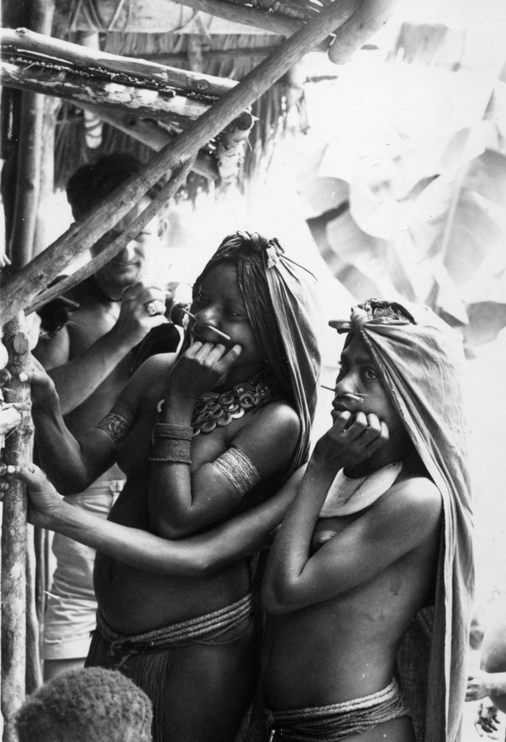 Yet these visitors were either relatives of the local people or men on traditional trading expeditions, and, thus, normal parts of the world I needed to learn about. 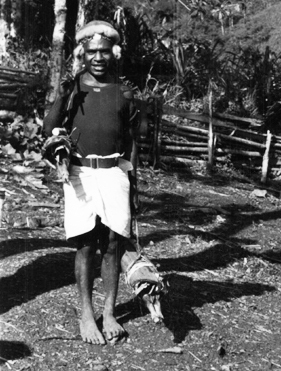 012-08: Luluai Warai, on an expedition from the Karam area near Simbai, carries two live piglets for trade. 012-09: Each small, furry, brown piglet had been carefully wrapped in banana fibre for safe transport. The second kind of "interruption" was actually a "sign of the times," and, unfortunately for me, we ourselves were among those "signs." The Maring were just as interested in learning about our way of life as we were in learning about theirs. Indeed, we had discovered during the deliberations as to where we would settle, as well as during the building of our house, that as many people as possible wished to contribute their work so they could earn valued trade goods and money. 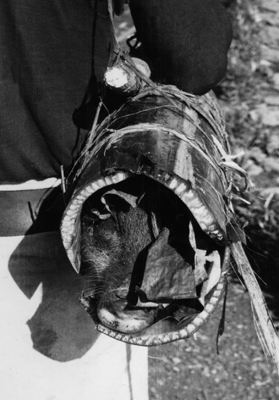 These items were fast becoming part of the traditional trade and gift-giving practices. 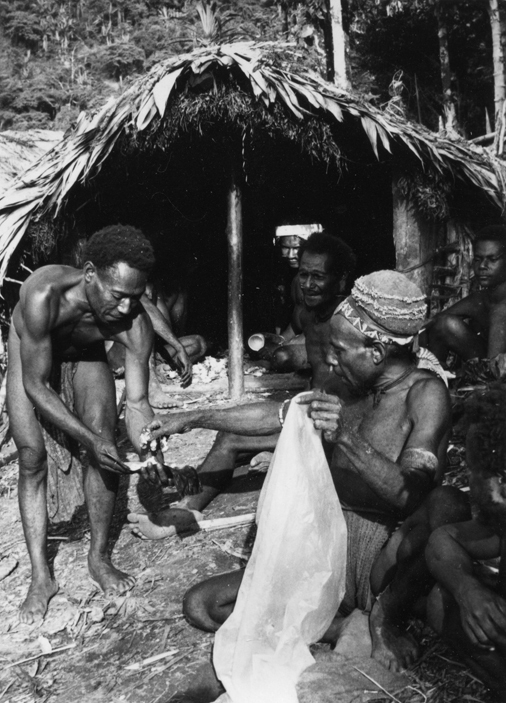 041-32: Luluai Pfun distributes salt to men who have helped build our house. And so, I should not have been surprised at the number of visitors who came to see us. 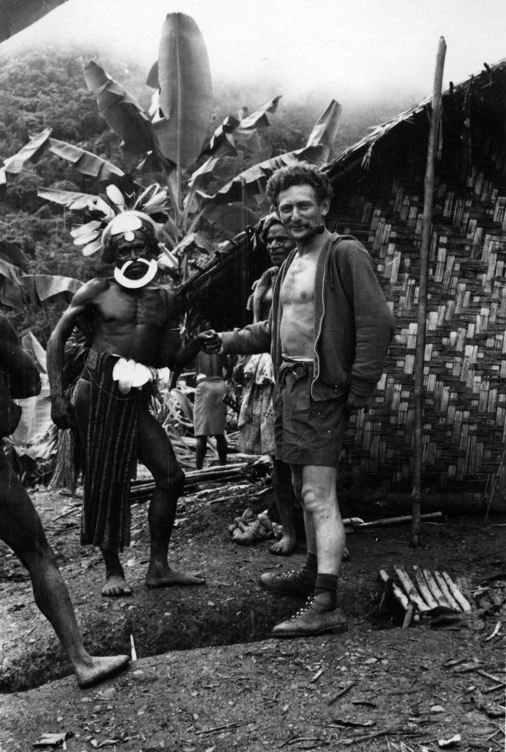 They arrived along the narrow trails connecting the Simbai and Jimi Valleys, and they came along the Kiap Road which passed directly beneath Gunts Yard. Those from enemy clans kept on going, but many others climbed the ladder into the yard and came right up to our house to meet us, whatever the time of day. 008-04: Women from Fogaikump peer into the front porch of the Vaydas' house. Sometimes I wished that a storm would blow up, ruffling the leaves of the banana trees which lined the edge of the yard, obscuring the view with curtains of rain. As the Maring did not "walk about" much in bad weather, heavy rain would offer a promise of time alone to talk, to work, even to have a nap undisturbed. But the variability of the weather always caught us off guard and, after an hour or two of rain, the clouds would dissipate and we would be "on display" again.